The planting has been chosen to combine the use of colour with prominence given to dark foliage. 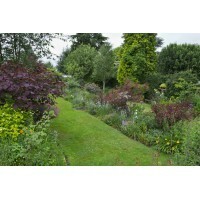 The garden has been redesigned and replanted over the past ten years and backs onto a working farm. 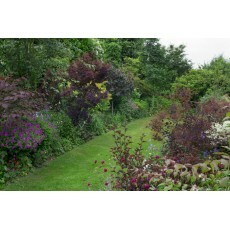 The planting has been chosen to combine the use of colour with prominence given to dark foliage. 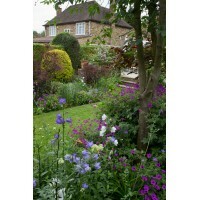 The garden it is in two halves divided by sleepers and dominated by a huge Foxglove tree.